If you thought Don Draper couldn't be more dapper, you should see him as a yellow puppet. 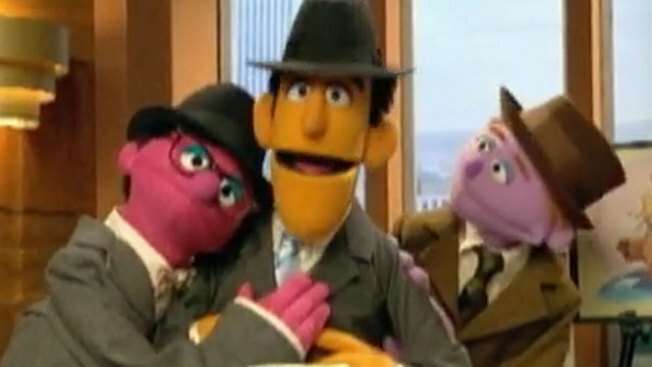 "Sesame Street", as part of its historic 40th season, has given a nod to the boys on Madison Avenue with it's own "Mad Men" parody. The segment, which is written on two not-so-subtle levels, gives children a chance to learn about sharing ,while adults get to finally hear Draper call his minions "sycophants"
Looking a whole lot like Bert -- sans Ernie -- Draper works his team through a bear-honey-raccoon pitch that makes everyone "mad, mad, mad," then "happy, happy, happy." Fortunately the Sesame Street take features less smoking, drinking and other illicit behavior than the real Emmy-award winning show. Either way, it kind of makes you want to watch both "Sesame Street"and "Mad Men" more often.